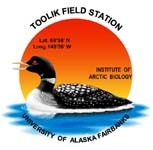 » Imnavait Watershed Thaw Depth Survey Summary for 2003 to present, Arctic LTER, Toolik Research Station, Alaska. Starting in 2003, thaw depth has been measured in the Imnavait Creek watershed several times during the summer season, and after after 2010 the surveys were made twice a year as close to 2 July and 11 August as possible (plus or minus 1-2 days). The UTM grid (stakes are in a grid at every 100 meters) was used to locate the starting points, and a tape measure was used to mark points every 25 m in between the UTM stakes. The grid covers the watershed from the valley bottom on both sides of the stream (in wet sedge tundra), up the hillslope of moist acid tussock tundra, to the top of the hillslope on the eastern watershed boundary in hilltop heath tundra. At each of 97 sites on the grid a ruled stainless steel rod was inserted in non-tussock microhabitat (that is, not on top of a tussock but in the space between tussocks) until the frozen layer was reached, and the distance was measured to the top of the upper soil organic mat (beneath the uppermost moss layer if present). Three measurements are made at each site (point on the grid) within a 50 cm radius of each location point. The measurements for all sites are averaged to arrive at an annual value of thaw depth for 2 July and for 11 August. Version 2: LTERNET Data Access server proxy changed from das.lternet.edu to metacat.lternet.edu. Version 3: Added LTERNET Data Access server proxy for Excel files. Version 8: Update from George to 2013.